Bruce Wayne is haunted by his past and protects Gotham City out of a tortured obligation to his dead parents, whereas Midnighter is a man without a memory, engineered to be a killing machine, trying to figure out who he is. Despite a tragic backstory, Midnighter has a surprisingly fun, cheeky personality; he has a sarcastic sense of humor, jumps at the opportunity to offend, and takes immense pleasure in causing pain to people who deserve it. The comparisons to Batman don’t go much further than them both being white men who fight crime in black costumes. 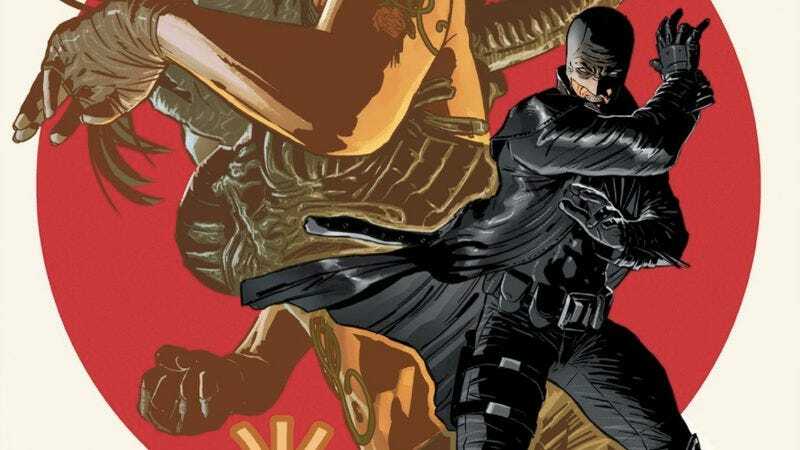 Writer Steve Orlando has increased the distance between the two characters in the new Midnighter ongoing series, primarily by devoting ample time to the hero’s romantic relationships. Midnighter is a rare superhero comic written by an LGBTQ creator (Orlando is openly bisexual) and featuring an LGBTQ character in any sort of leading role. Prioritizing Midnighter’s love life has given the book an emotional core that is surrounded by thrilling superhero action. Each issue has balanced big action sequences with intimate character moments showing Midnighter on dates with different men, and the dynamic between who he is with and without his mask gives the character dimension he hasn’t had since becoming a part of the mainstream DC universe. Thanks to characters like Omar from The Wire and DC’s own Batwoman, “badass” is becoming a more common adjective for gay characters. Orlando is very aware that a big part of Midnighter’s appeal is the wild action that follows him wherever he goes. This week’s Midnighter #2 jumps between Midnighter fighting a grieving martial arts instructor seeking vengeance for her husband’s death and Midnighter on a date in Moscow, where he encounters homophobic natives that he gladly beats when they express their disgust at his behavior. Both plotlines reveal different aspects of the character, but work together to cement Midnighter’s place as a hero that fights for the underdog: gay, straight, or otherwise. Marina Lucas lost her husband when Windcrest Foods willingly released a product that the company knew could cause a lethal allergic reaction in consumers. When a mysterious figure gifts her with a supernatural weapon, she takes the fight to the corporation and goes after its board of directors. Armed with the “Six Killing Sounds,” Marina just needs to say one word to bring opponents to their knees, but that’s not going to stop Midnighter, especially after he rips out his ears (don’t worry, he grows new ones). After maiming himself, Midnighter makes his way to the roof of the building, ties a rope to a ventilation pipe, and jumps off, swinging down and around to crash through the window where Marina is intimidating the three heads of Windcrest Foods. It’s an awesome widescreen action moment, and it’s immediately followed by an awesome small-scale action moment when the story jumps to Midnighter and Matt on their date in Moscow. ACO’s flashy artwork in the first issue of Midnighter featured layouts that occasionally sacrificed clarity for spectacle. This issue’s artist, Alec Morgan, has a grittier style that helps ground the story as it delves deeper into Midnighter’s personal life. There are elements of Guy Davis’ work in Morgan’s scratchy inks and Eduardo Risso in his character expressions, giving the issue a Vertigo-esque aesthetic that is a great fit for a hero that doesn’t fit the DC Comics norm. Morgan’s action staging is dynamic and powerful; a small panel like Marina kicking open a door is given immense impact thanks to the force and speed Morgan captures in his linework and composition. Morgan’s action hits hard, but the most striking thing about his artwork in this issue is the detail he puts into the environments, and the scenes in Moscow have some gorgeous establishing shots that make the setting blossom. Those images pop thanks to Romulo Fajardo Jr.’s coloring, which brings a lot of depth and texture to Morgan’s linework. He helps maintain visual consistency between the two artists, and the value of Fajardo’s work becomes very apparent when he’s gone. While Pete Pantazis’ coloring on the last five pages is more than competent, it doesn’t have the extra shaping that Fajardo achieves by adding white highlights to establish clearer light sources, and that extra specificity in Fajardo’s colors enriches Morgan’s work. Having a fill-in artist for the second issue of a series would normally be cause for concern. But the Midnighter editors make a wise decision bringing Morgan on board, giving the book a different flavor that is still complimentary to Orlando’s scripts while establishing early that the series will feature a rotating art team. (ACO is back next issue, and Grayson’s Stephen Mooney will illustrate the following two chapters.) If a rotating art team is what it takes to keep Midnighter looking tight on a monthly schedule, then bring on the fill-in artists, because this issue shows that Orlando can adjust his writing to fit the strengths of his collaborators. DC should do whatever it takes to maintain the quality of this series, because after just two issues, it’s quickly become a superhero title that the industry needs.